Do you want to prepare Fish Fry in your home? 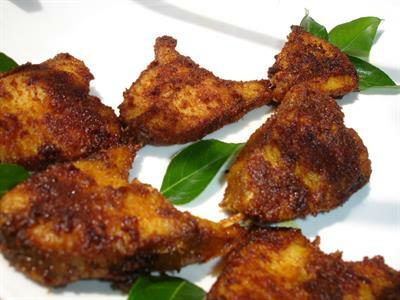 Then try to prepare Kerala Fish Fry which has good taste and spicy. Kerala Fish Fry is very special and famous in Kerala. Read here about Ingredients and Preparation methods of Kerala Fish Fry which can help to prepare it easily in your home. Kerala fish fry is most likely be every Kerala people and it is easy to prepare and this provides good nutritious Profile like proteins, vitamins, calcium, iron, potassium etc., And important nutrient available in this Kerala fish fry is Omega 3 fatty acid. Kerala fish fry takes a preparation time of about 10 minutes; for cooking also it takes about 10-15 min totally the Kerala fish fry will be ready in 30 minutes. For average Malaya lees their lunch is not complete without fish fry in addition to this fish fry is mostly available in Kerala cuisine. Let us see what the ingredients used for it. STEP 1: At first cut the fish into equal pieces and clean it will with ample amount of water. STEP 2: Grind Ginger, garlic, Chili powder, pepper, Turmeric powder, mustard seeds, curry leaves, lemon juice. and salt and make to paste. STEP 3: Now Mix the Fish Pieces with the ground paste and keep it aside for some time for at least 30 minutes. STEP 4: Heat coconut oil in pan and put the mixed pieces of fish with Ground paste in the pan to make it fry. Please make sure turn side to side to make the fish full fry to avoid the raw smell of fish. STEP 5: Now at last Kerala Fish is ready for serving and Serve it with onions and lemon wedges. Please make sure clean the fish properly and fry it in the pan till it gets fry completely. Now the delicious fish fry of Malaya lees is ready and enjoy it, almost in all Kerala cuisine it will Take its place. Take a try on it and enjoy it. If the fish pieces are large make sure you have to cut the fish into some pieces in order to make it fully fry and so that masala paste will absorb it fully. By following the instruction above you will be now ready with the Kerala Fish Fry.